For the skincare fanatic I have two products which I absolutely love, I have been using these for over a week now and they are perfect for my dehydrated skin. First up I have the Merumaya Melting Cleansing Balm £15.50 . I've never really used a cleanser like this before but I find it so relaxing, not to mention that it does a fantastic job at removing every trace of makeup. I literally use a dollop of this on my dry skin & massage it all over the face for a good two minutes before I rinse it off with water. It doesn't strip my skin of moisture but it doesn't feel super greasy either, as it changes to a milky solution when it's in contact with water. I like to use this in the morning to remove any grime build up throughout the night and it's working perfectly for me so far. Next up a brand that I didn't have the best of luck with in the past, but I can confirm that with this product they have definitely got my thumbs up. The Claudia Louch Hydrate Mango Face Cream is the priciest of the bunch at £61.50 but can we just admire the luxurious packaging. The cream even comes with its own velvet pouch for travelling which I love. The only downside to the packaging is that you won't know when you run out of the cream considering the black pump dispenser, but it certainly looks pretty on my skincare shelf. I use about 2 pumps in the morning after cleanser and serum. It has a very light fruity scent, nothing overpowering and it's absorbed into the skin immediately. It keeps my skin hydrated well all day long with no dry patches in sight, so a winner for me. 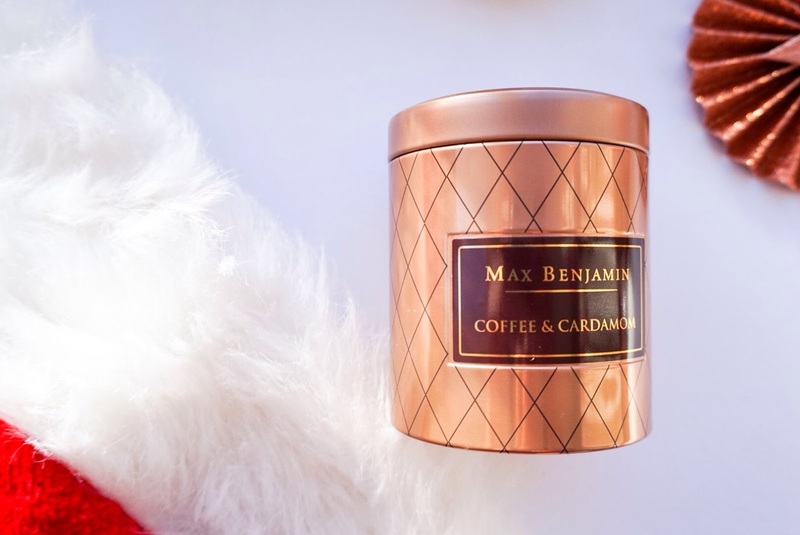 For the home accessories lovers I have a candle from Max Benjamin Coffee Candle Range which you can buy on Amara for £14. I love the copper packaging (bloggers dream right) and the scent is so unique. I always feel like candles are a pretty safe bet when it comes to stocking fillers because most people love them and they are perfect for the cold winter season. I wasn't sure what to think at first of the Coffee & Cardammon scent (definitely not a combo I would have thought of) but it works so well & it leaves my kitchen smelling amazing. For the bath lovers (that's definitely me in the winter season as I could bathe all day), I have two Christmas style baubles. 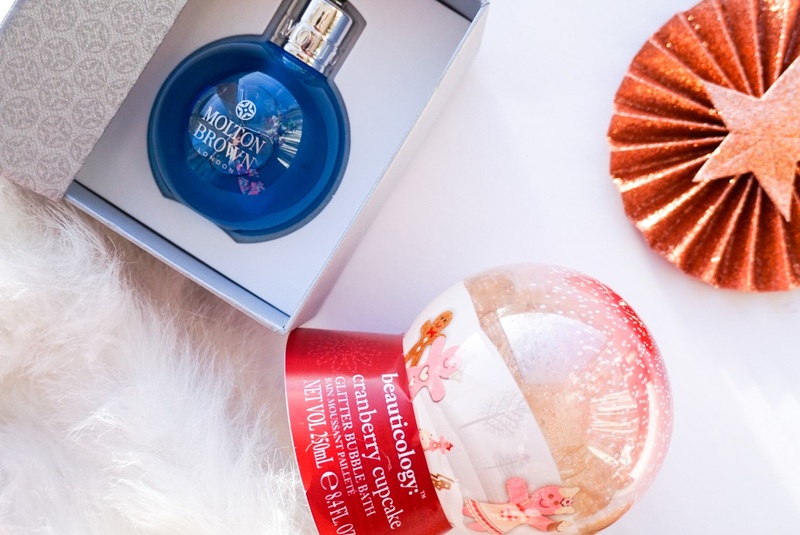 First up is a gorgeously packaged Molton Brown Templetree Festive Bauble Shower Gel £10. I love that it comes in its own little gift box. The templetree flower scent is so invigoration and perfect for a morning shower to wake you up for the day. Next up is a sweet smelling bath bubbles option from Beauticology £4, a brand I have never tried before but eager to get to know better. I've already used this up and it was a pleasure to bathe in a sparkly bubble bath, not to mention that the Cranberry Cupcake scent was amazing. 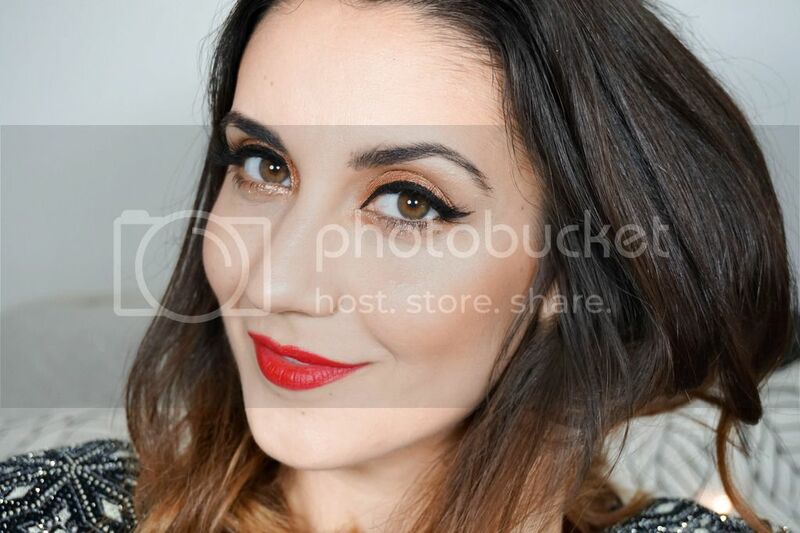 Last up I've got a few bits for any makeup lover out ther (me me me all the way). First up a very stylish makeup bag to store all your new bits & pieces. 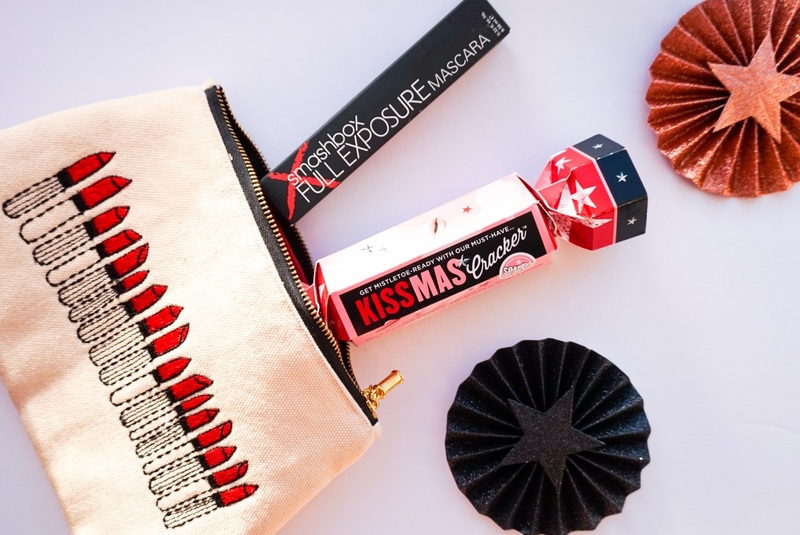 This is an Emma Lomax London Classic Lipstick Pouch from Amara for £20 and I just love the simple yet effective design. I will no doubt be bringing this away with me for Christmas, as it fist all my essential makeup products perfectly. Next up is the Smashbox Full Exposure Mascara £19.50 which I'm really happy to be trying out as I'm still quite new to the brand. The brush of this wouldn't be my favourite as it's a fibre brush and it's also quite thick, making application a bit messy. The few times I've tried it so far I managed to get it all over my lids, which took a while to clean up. However the good thing about this mascara is that it really does create gorgeous long lashes with great volume too. I'm hoping I'll get better at using it over time because I love the finished result. Very last product of the bunch is a cute Soap & Glory Kissmas Cracker £6... beauty crackers are so much better than regular crackers right, especially when there's a mini lip gloss plumper waiting inside. I wasn't sure what to expect of the plumping claims, but this definitely causes a tingling sensation. I don't mind it so much, in fact it's quite different and I like that. I'm not sure if it plumps up my lips as such, but I guess it makes them look a bit fuller even just from the super glossy finish. And we've come to the end, have you made it?! Well done if you have (pat on the back too). 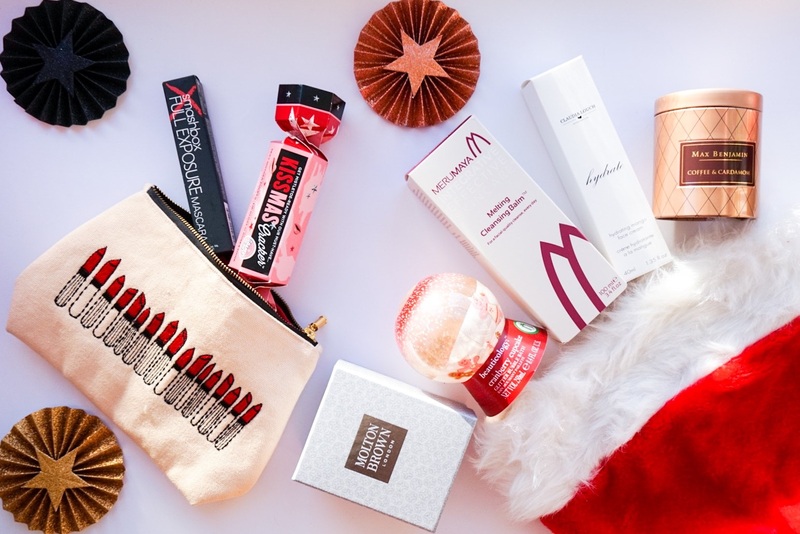 I hope you enjoyed reading another festive post from me and I would love to hear your thoughts on any of the stocking fillers I have here... Have you tried anything from the list?